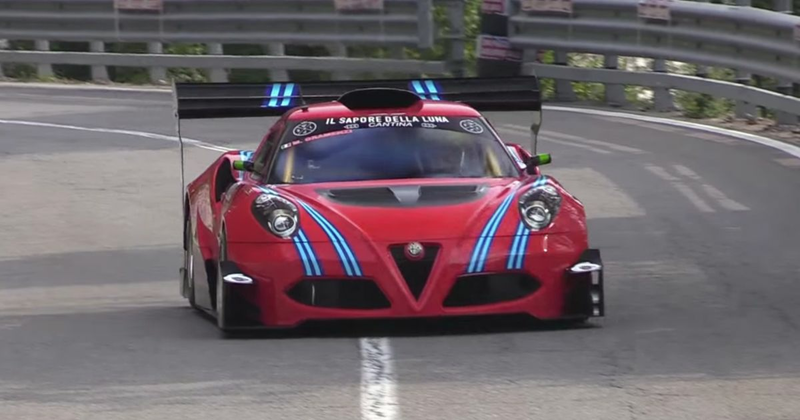 While this monster may still look like a 4C, there’s not a whole lot of the original car left. The original carbonfibre tub is still there, but that’s about it. The wheelbase has been extended by 30mm, while the suspension is now a push-road setup. The wheels are dinky 13-inch, single-seater style jobbies with fat tyres, and the 1750cc engine is now mounted longitudinally instead of transversely. It produces a massive 600bhp at 8200rpm, chucking its power to the rear via a Hewland TMT-200 sequential gearbox. Recommended car throttle shop Worldwide Shipping In The CT Shop Car Throttle Submit Your Videos To Get Featured On Our Social Channels Motorsport New Williams Driver Tried To Secure His Seat Using Microsoft PowerPoint Motorsport We're Endurance Racing This 69bhp Ford Ka For Grass Roots Thrills Motorsport Formula E Has Now Had Seven Winners From Seven Teams In Seven Races Motorsport Max Verstappen Forced To Do 'Public Service' After Post-Race Shove Motorsport This Bizarre Accident Almost Blocked The Pit Lane In A Supercars Race Motorsport F1 Teamed Up With The Chemical Brothers To Create The 'World's Fastest Remix' For Some Reason Motorsport You Could Get Lost In This Cosworth-Engined BMW E36's Diffuser Motorsport Are These Unusual Facts About Michael Schumacher True Or False?